Many self-produced CDs have a rough-and-ready look, but with a little care and an ink-jet printer, their appearance can be improved a great deal. First, there's the question of what to do with the disc surface. Sticky labels can be fed on a sheet into most kinds of printer, although they can be tricky to apply smoothly. Blank discs with printable surfaces are readily available, but of course you need hardware that explicitly supports printing directly on to CDs. My own experience is that printable-surface CD-Rs are slightly less reliable when it comes to audio CD player compatibility, but perhaps I've just been unlucky. Either way, you need to prepare your artwork and find a driver that supports printing on to circular media. 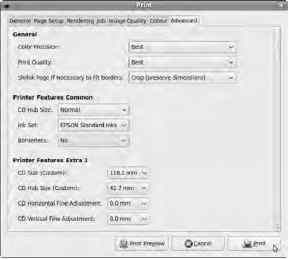 The good news is that the Free Software Gutenprint drivers offer support in GNU/Linux for direct CD printing on Epson ink-jets that have the feature. This includes print-size settings for both standard 5-inch (120mm) CDs and 3-inch (80mm) mini CDs (the latter size was once used for CD singles). Driver support on other printers with CD trays may be incomplete, so it's recommended that you check the OpenPrinting database at www.openprinting.org for details of your specific model. Many GNU/Linux distributions include Gutenprint drivers by default. On Ubuntu, you can find these drivers in the cups-driver-gutenprint package, which is installed using the Synaptic Package Manager. You may also wish to install the gimp-gutenprint package; it's a plug-in that adds a new print dialog to the GIMP, with finer control over printing options. Even with driver support, ink-jet printing onto CD surfaces can be a little hit and miss. I'm currently using an Epson Stylus Photo R200, which was the lowest-cost decent-quality model with CD printing features I could find (see Figure 10-26). The model is now discontinued, having been replaced by the Epson Artisan 50, which retails for around $100. The print quality of the R200 with Gutenprint is generally very good, although the CD feeding tray can be difficult to get working. The trick is to leave the cover of the printer open and check that the leading edge of the CD tray is engaging with the motorized rollers that drag it under the print head. If not, a slight shove gets it moving in the right direction. Figure 10-26. Epson's ink-jet printers can print on the CD surface, if you're prepared to coax them a little. An application used for preparing artwork for CDs should support vector file formats and have PostScript output, because you want your fonts to be crisp and clear. Inkscape and Scribus are good choices, with Scribus being particularly useful if you need to generate PDF output for someone else to print. You can use the GIMP if you prefer, as long as you make sure your bitmap output has high resolution; but the following example uses Inkscape. Refer to Chapter 4 if you've skipped ahead and don't have Inkscape installed and running. By default, Inkscape opens with a blank A4 canvas, but you need to set up the size that's required for your CD. Choose File > Document Properties, and set the default units to millimeters. This setting is a lot more useful for a CD than points, the traditional typographer's unit of measurement. Then, in the "Custom size" box, change the Height and Width values to 120mm, or 80mm for a mini CD. Figure 10-27. Set the Inkscape document size to ensure correct alignment in the printer. Close the Document Properties box, and you see a square canvas. I find it useful to draw circles representing the outside and inside of the printable area of the disc, as a guide. This is easy to do with the Circle, Ellipse, and Arc tool on the toolbar at left (the pink circle). Hold down the Ctrl key while dragging to get a regular circle. The exact size of the printable area around the CD hub depends on your particular brand of blank media and your Gutenprint settings, but Figure 10-28 allows a generous diameter of 40mm. Before printing, you can right-click these guide objects, select Object Properties, and check the Hide box, so they don't show up on the printed disc. You can also drag vertical and horizontal guides from the rulers to give you an idea where the center of the CD hub is. Figure 10-28. Guidelines and circles help you center the CD design. Using the Text tool from the toolbar, labeled with an A, is straightforward, although the default font isn't very interesting. To fix this, open the Text and Font dialog from the top menu bar, labeled with a T. In this dialog, select a font family and style; you probably need to increase the font size for a title. The font in your artwork isn't updated until you click the Apply button. This example uses a font called Delta Hey Max Nine Regular by Ray Larabie, in 56 point and 30 point sizes (see Figure 10-29). You can find Larabie's TrueType fonts packaged for most GNU/Linux distros, or you can download them directly from www.larabiefonts.com. In Ubuntu, you can install the ttf-larabie-straight, ttf-larabie-uncommon, and ttf-larabie-deco packages using Synaptic. Figure 10-29. 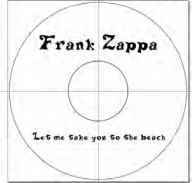 Ray Larabie's freaky font makes the CD look more interesting. To color your fonts, use the Fill and Stroke dialog, which you open via the paintbrush icon on the top menu bar. Fill refers to the body color of the font, and stroke is the outline color; by default, there's no stroke on the font, but try different stroke paints and styles to see if you like the effect (see Figure 1030). Figure 10-30. Adding a touch of color makes the font stand out even more. When you're ready to print, check the printer control panel of your GNU/Linux distro to fine-tune your Gutenprint settings. 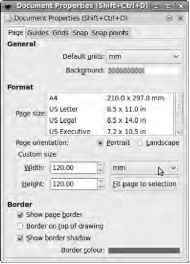 Scribus allows you to do this from within the application, using the Options button in the Print dialog; but Inkscape appears to rely on the system's print dialog. 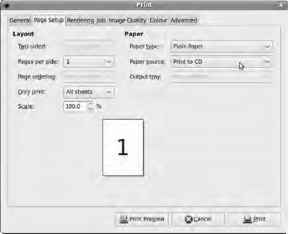 When you run Inkscape on Ubuntu, on the Page Setup tab of the print dialog, you need to change "Paper source" to Print to CD so the printer knows which tray to feed (see Figure 10-31). On the Advanced tab, you can specify the CD hub size and fine adjustment values (see Figure 10-32). Make sure Backend is set to Vector, not Bitmap, on the Rendering tab. Then, click the Print button, and the job is sent to the printer. Figure 10-31. Check your print settings to make sure you're sending the artwork to the correct tray. Figure 10-32. Careful review of advanced settings makes sure you don't waste ink and blank discs. 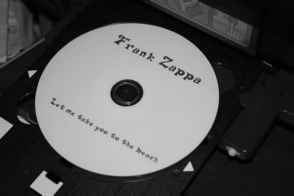 Printing packaging for your CD is much the same as printing on the disc, except that you have a lot more flexibility. It's simple enough to design inserts for standard jewel cases in Inkscape, although having a rotary paper trimmer available makes cutting the insert a lot more accurate than cutting by hand. The dimensions of the inserts should be available from your CD case supplier; if not, careful measurement and a little trial and error produces the figures that you need. But no law says a CD has to be in a plastic case—you can wrap it up like a parcel or get creative with origami if you want to.